"Meiboku sendai hagi (Sandalwood and bush clover of Sendai: 伽羅先代萩) dramatized the intriques [sic] over succession within the Date clan of Sendai during the third quarter of the seventeenth century. It was performed in an alternate sekai ("world" or theatrical setting: 世界), set back in time during the Onin civil war under the Ashikaga shogunate of the fifteenth century (Ashikaga thus becomes a theatrical substitute for the Date clan name). It is a classic play, so popular that during the Edo period it had at least one performance nearly every year since its premiere in 1777. The fictionalized central story involved Lord Ashikaga Yorikane's forays into the pleasure quarter and his murder of the courtesan Takao (高尾). This episode is an amplification of an actual incident in which the twenty-one-year-old clan leader Date Tsunamune became the lover of the Yoshiwara courtesan Takao, causing a scandal that led to his downfall. Another story line involves Nikki Danjō (Yorikane's evil nephew), the orchestrator of a conspiracy to overthrow Yorikane. The intrigue failed, however, and Nikki was slain. The giant ghostly rodent lurking behind the two protagonists [in a Hirosada diptych] is actually Nikki, who possess magical powers and can transform himself into a rat. He is a prime example of an important role type known as jitsuaku (or tategataki) — unrepentantly evil samurai who plot to overthrow their lords. They are also referred to as kuni kuzushi ("demolisher of nations") to signify their intention to usurp an emperor's throne or a daimyō's domain." We have added a link above to a similar diptych by Ashisato (active from ca. 1800 to 1816). In both this example from the Lyon Collection and the one in Boston the actors are the same. If you look closely at both costumes you will see that there are common motifs even though at first glance their outfits seems considerably different. 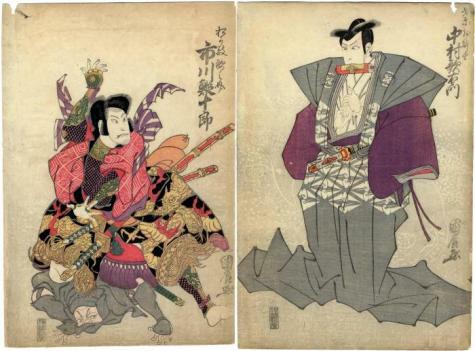 This diptych commemorates a performance at the Kado Theater in the ninth month of 1816. The fellow in the gray outfit being subdued on the left is meant to represent a giant rat.